Autumn in Arkansas isn't complete without its lineup of family-friendly festivals and fairs! Autumn in Arkansas isn't complete without its lineup of family-friendly festivals and fairs! Take a spin on a carnival ride, enjoy a performance at an arts festival, and sample some of the tastiest treats in the state. Here are 23 memory-making events, from a hot air balloon festival to a good old county fair. 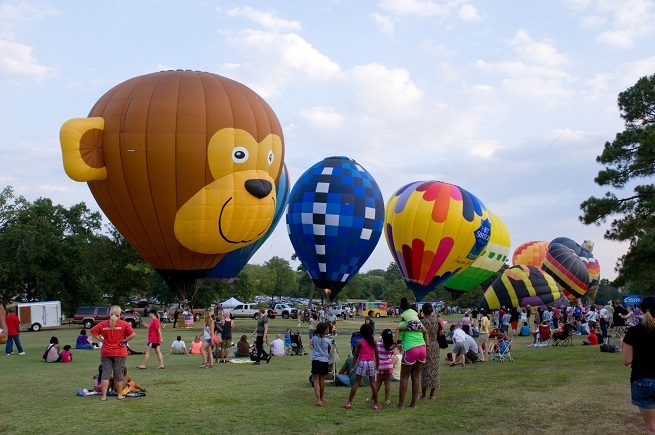 23rd Annual Arkansas Hot Air Balloon State Championship in Harrison: Bring your lawn chair, $5 for tethered rides (Saturday only) and enjoy an art festival on the square, a car show, a 5K and much more. This event is hosted by Harrison Regional Chamber of Commerce. Check the schedule for event details. For info: 870-741-2659, website. Main Street Food Truck Festival in downtown Little Rock: Browse more than 50 food trucks, dozens of craft vendors and more in downtown Little Rock. The festival will span six blocks North and South along Main Street and three block East and West along Capitol Avenue. Main Street will be blocked off from 3rd to 8th Streets and Main to Center Streets on Capitol Avenue. Entrance to the festival is free. 11 a.m.-6 p.m. For info: mainstreetfoodtrucks.com. Harvest Night at the Arkansas Foodbank in Little Rock: This family friendly event at the Arkansas Foodbank includes a southern-style dinner, local craft beverages, live entertainment and children’s activities. A relaxed atmosphere provides a night of fun for the whole family, while raising awareness about the Arkansas Foodbank’s work. 5-8 p.m. Kids get in free, adult tickets are $40. Proceeds go to support the Foodbank. For info: arkansasfoodbank.org. Little Rock Paper Airplane Festival at Clinton Presidential Park: Hosted by the Lymphomaniac Society at the Clinton Presidential Park, this family-friendly event raises money to help those currently being treated for cancer. The event will feature various exhibitors talking about the mechanics of paper airplanes, what it takes to create the perfect paper aircraft, sustainability and recycling. Kids can then compete in three age groups to see whose paper craft flies the furthest. Starts at 11 a.m. Free to attend. Visit the website for more info and for details about entering the competition. Tinkerfest at the Museum of Discovery: Get ready for a day of science fun at the Museum of Discovery. At this annual event, tinkering takes over the entire museum and neighboring streets for a day-long event with more than 40 hands-on, interactive activities. Each activity engages children and adults, teaches visitors how everyday objects such as cars and computers work, and provides opportunities to explore the engineering and science behind building objects. 9 a.m. - 3 p.m. $8-$10 admission. Visit the website for info. Lonoke County Fair & Livestock Show at Lonoke County Fairgrounds: Enjoy a carnival, pet show, talent show, and parade! Visitors can also explore exhibits, such as livestock, horticulture, arts and crafts and more. Special events include the Red Neck Games and lawn mower races. Check the website for more event details. Gate admission is $4, children $2, children under 6 free. For info visit the website. Faulkner County Fair at Conway Expo Center and Fairgrounds: This year's fair is themed "80 Years of the Greatest Show on Earth." Enjoy a midway, home economic booths, commercial exhibits, live entertainment, and livestock exhibits filled with sheep, cattle, hogs, rabbits and more. Cheer on the floats as they parade through downtown Conway at 5 p.m. on Tuesday, Sept. 18. For info: FaulknerCountyFair.net. Acansa Arts Festival at Various Locations in Little Rock & North Little Rock: Acansa Arts Festival inspires public appreciation for the arts while enriching the economic and cultural vitality of central Arkansas. The festival promotes positive collaboration between regional arts organizations, local businesses, government, and civic groups. Children's Day is free and takes place Sept. 22 from 11 a.m.-1 p.m. at the Hillary Clinton Children's Library. For info: (501) 663-2287, ACANSA.org. Barnaroo at Heifer Village and Urban Farm: Head to the barnyard at Heifer International for a celebration of international transFARMations! Enjoy hands-on crafts for kids and adults, engage in international activities, meet the cutest barnyard of animals and try a variety of international foods. The fun goes from 10 a.m.-2 p.m. For info: Facebook. FREE! Arkansas Peace Fest at Little Rock Central High School: This celebration features speakers, music, food, children’s activities, art projects, and information about organizations that support peace in Arkansas. 2-5:30 p.m. For info: ArkansasPeaceWeek.com. FREE! Festival in the Park at Two Rivers: The festival will feature activities including bounce houses, a 40-foot maze, a construction zone and hero zone. Attendees are encouraged to bring their four-legged friends for a pet parade and “Wizard of Oz”-themed dog costume contest. There will also be food trucks on site as well as a beer garden for parents to enjoy. 11 a.m.-6 p.m. For info: website. Little Rocktoberfest at Dickey-Stephens Park: PARENTS NIGHT OUT! Enjoy a beer festival celebrating craft beer, local breweries, and the home brewing hobby. Enjoy samples of various brews; food and other beverages available for purchase. Must be 21 to enter. 6-9 p.m. $45 at the gate; tickets purchased online are $35. For info: littlerocktoberfest.com. IndiaFest at the River Market Pavillions: Celebrate Indian culture and food at this free outdoor festival. Food for this event will be cooked by local Indian families who are enthusiastic about presenting unique flavors of different regions of India to the people of Arkansas. There will also be children’s activities and education throughout the festival. 11 a.m.-5 p.m. For info: website. FREE! Fall Fest & Buzzin' BBQ Bash at Bishop Park in Bryant: Join local businesses, school groups, clubs and talents in this festival of fun and food! Activities include a parade at 11 a.m., cardboard boat race at 9 a.m. and Kidsland open all day long. As part of Fall Fest, don't miss Bryant's Buzzin' BBQ Bash, with delicious BBQ, games, face painting, giveaways, arts and crafts booths, and exclusive carnival food vendors and concessions. Voting tickets available for purchase to vote on favorite BBQ. 9 a.m.-2 p.m. Admission & parking are free; food and Kidzland admission vary. For info: (501) 847-4702, BryantChamber.com. World Fest at War Memorial Park in Little Rock: Presented by the Little Rock Racial and Cultural Diversity Commission, World Fest offers students of all ages a multicultural learning experience through a variety of activities, including a global village, fair contest and performances. 9 a.m.-2 p.m. For info: RCDCWorldFest.org. Conway Eco + Arts Fest 2018 at Laurel Park: Head to Laurel Park from 11 a.m.-4 p.m., will feature fun for the whole family with live performances as hands on art actives, and exhibits featuring local artists. For info: Facebook. 4th Annual Arkansas Honey Festival at Bemis Honey Bee Farm & Supplies: The Arkansas Honey Festival is an educational event that celebrates honey and the bees that make it. The day will be filled with workshops, honey tasting, honey contests, honey smoothies, honey extracting and more! Peruse the food trucks and visit a kids area will filled with bounce houses, face painting and other activities. Goes from 9 a.m.-4 p.m. For info: Facebook. Great Arkansas Goat Festival at the Perryville City Park: This one-of-a-kind festival is all about goats! From 10 a.m.-6 p.m., the whole family can enjoy a goat parade, goat costume contest, goat races, America's Goat Talent Show, live music and food vendors. Teh festival is free. For info: ArkansasGoatFestival.com. Arkansas State Fair in Little Rock: Is it really fall if you haven't gone to the state fair? Enjoy tons of carnival rides, visit farm animals, watch a rodeo, and fill up with fried food. Click here for ticket information. Open and close times vary by day. For info: ArkansasStateFair.com. World Cheese Dip Championship in Little Rock: Skip lunch and leave room for lots and lots of cheese dip. Enjoy live music as you make the rounds at the Clinton Presidential Center grounds taste testing some of the world's best cheese dips from amateurs and professionals alike from noon-4 p.m. Early bird tickets purchased online are $10 and kids 6 and under get in free. For more information, visit the website. Arkansas Cornbread Festival on South Main Street in Little Rock: Who doesn't love cornbread? Cornbread, community, music and fun – that’s what makes the Arkansas Cornbread Festival special. Enjoy lots of snacks, shopping and live music at this classic southern fall event. Tickets are $8 online and $10 at the door. 11 a.m.-4 p.m. For info: arkansascornbreadfestival.com. HarvestFest in Hillcrest: You'll find concerts, tons of food, free kids activities, fashion shows and tons of vendors taking over the streets of Hillcrest at this family favorite festival. Make sure to hit up the pancake breakfast. A portion of the proceeds from this event goes to support The Allen School, an organization for young children with developmental delays. Starts at 7 a.m. and live music begins at noon. For info: harvestfest.us. Free to attend the festival; breakfast and other activities have various costs. Chili Fights in the Heights: Welcome in cool fall weather with this cozy and tasty event. Chili Fights in the Heights is a neighborhood festival with two purposes: to have fun and to raise money for the Arkansas Foodbank. For just $5, attendees get to taste tons of delicious chili and then vote on their favorite. Festival goes from noon-7 p.m. For info: chilifights.com. For more events in central Arkansas this fall, visit our full online calendar here.